Disney just released three wonderful Studio Ghibli films on Blu-ray, The Secret World of Arrietty, Whisper of the Heart, and Castle in the Sky (Blu-ray). All three films are fantastic (Studio Ghibli and Disney make a wonderful pairing), and all have 2-disc release packages which come with both a Blu-ray version and a DVD version. They look superb in high-def Blu-ray, though the DVD versions look great as well, especially if you have an upconverting DVD player. I have profiles for each of these three films already on my website (The Secret World of Arrietty, Whisper of the Heart, Castle in the Sky), so there's not much of a need for me to give a summary of each one in this review when you can just go check those out. All three films are worth watching and are appropriate for just about all ages. And I really mean that, as adults will love these as much as (if not more than) children. The animation is exactly what you'd expect from a Studio Ghibli release, smooth, detailed, and easy on the eyes with a lot of very natural backgrounds. The characters are very realistic in their personalities, attitudes, and expressions which makes them and the story feel all the more real. 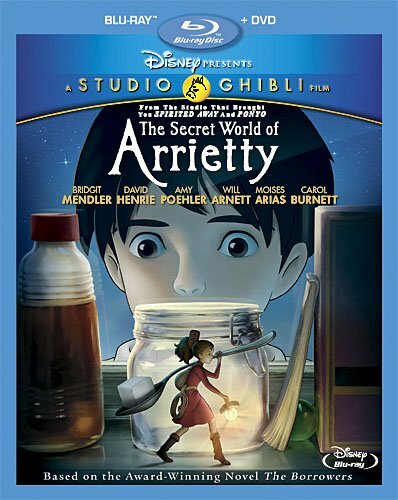 I like the Behind the Studio and Behind the Microphone extras, so it was a bit disappointing that The Secret World of Arrietty didn't have something like that. I also don't think the extras make the Blu-rays much more special than just plain DVDs. As I said before, both look great, and if you have a Blu-ray player then you'll probably want the Blu-ray version, but for the quality not because of the extras.